Last week I wrote about the biggest challenge digital communicators face. However, it’s far from the only one; in fact it’s one of many. One of the big emerging challenges right now is that, after a few years of PR agencies leading the way, we’re seeing advertising agencies throw their hats into the ring for social media in a serious way. Ad agencies, to generalize, often come up with big ideas but they’re often based around one-way “push” messages, rather than dialogue (in fitting with the short-term quarterly campaign-based model of thinking that I’ve discussed recently). The campaigns that do solicit feedback rather than action, do so in a superficial way (contests, for example), rather than in a way that reflects genuine engagement and relationship-building (Dell IdeaStorm, MyStarbucksIdea, for example (Starbucks is an Edelman client). Over the last few weeks, I’ve done a fair amount of thinking about Edelman’s Trust Barometer survey and how the results speak to some of the challenges that PR agencies currently face. The 2010 Trust Barometer results speak clearly to the implications of this approach. While trust in digital communications is now up to the point of other media (people trust search engines more than corporate communications nowadays, for example), a one-way approach is perhaps the least suited to building trust with companies’ stakeholders. The results show that one-way uses of social media actually marry two of the least-trusted sources of information – advertising and company sites (this is consistent with Forrester’s take on the strengths and weaknesses of different media). They then layer that on top of social media which, while gaining in credibility, is still not credible as a source on its own. The picture we’re left with is a complicated one. How do you work academics, experts or analysts, for example, into consumer-focused promotional activities? Social networking sites, in general, are populated by people with whom we have no connection. We’re more likely to trust people we do know, rather than an abstract “crowd” on Facebook (for example). These sites are still new, and while they’re increasing in relevance (hence more journalists using them as sources) they still have some way to go. For social sites to be trust-worthy, we need to move beyond just creating a presence on the sites and to focus on providing useful content from credible sources and building relationships over the longer term. 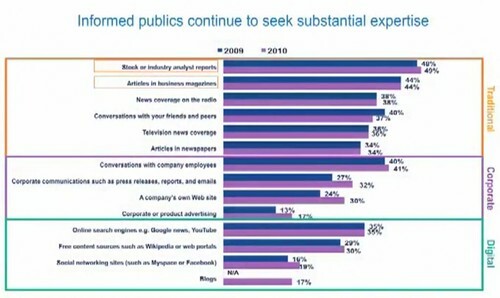 That’s why I think our approach to digital engagement is one that works, and one of the reasons that I think that social corporate communications is going to be a fascinating area over the next few years as companies figure out how to reach people in ways that build trust as well as attention. It’s also another signal that communicators’ jobs now, perhaps more than ever, revolve around reaching people with multiple sources of information – it’s an “and” world, not an “or” world. I don’t understand this. Did you write this as an example of what non-users believe about online social networks? Facebook in particular is completely populated with people whom I personally know. (People who connect with a larger number of strangers than friends on Facebook actually don’t use Facebook very much; they’re the ones who always complain that it’s “stupid.”) When you hear, “People go to Facebook before they go to Google,” it’s because they ask their friends for suggestions before they ask a search engine.